Ahhhhh….retreat weekend….and I got so much done! No, really! I arrived at retreat on Friday morning with everything except the outer sashing cut for The Pink One’s mermaid quilt. I blogged about the finish here. Yes, I said FINISH! Yee Haw! Saturday I pressed and cut 17 or so FQs and lots of yardage of Twice as Nice by Riley Blake Designs that I picked this up over the summer at Millie P’s in Anoka, MN. 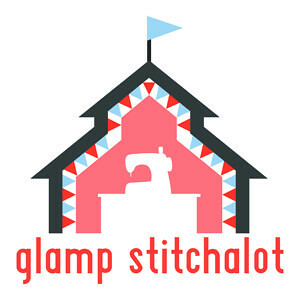 (LOVE that shop!) 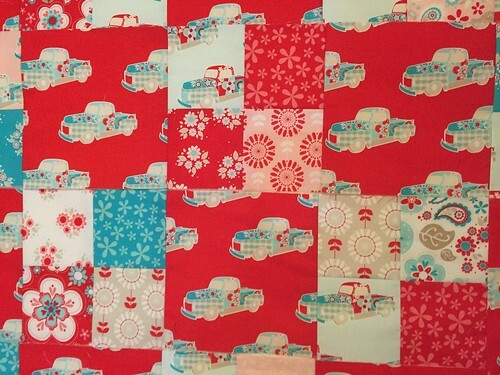 I knew I wanted to do something with big blocks to showcase the red trucks – they’re the best part of the fabric. After an exhaustive Pinterest search (yeah, right), I found a great tutorial by Amy at Diary of a Quilter for a Fast Four Patch. When I showed it to Gretchen, she said ‘that will be quick’, and I agreed. Well, it wasn’t super duper quick, but I did manage to get most of my 4-patches sewn together on Saturday night and all of my strips sewn together today before I left the retreat. I even managed to get two rows sewn together tonight while the kids were showering tonight. This is going to be another big quilt! 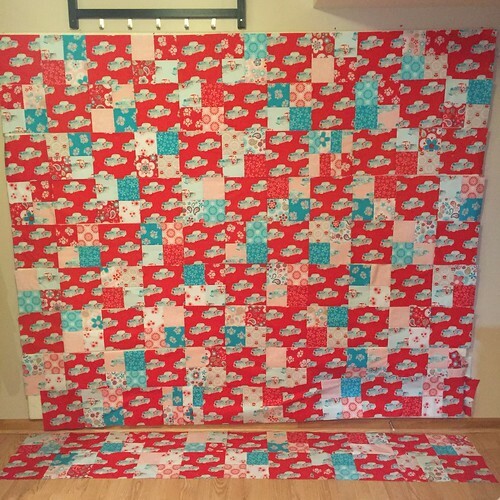 I adjusted the layout from Amy’s tute to fit the # of FQs and yardage I had. This is 11×11 blocks square – will be 88×88 when finished. I was kind of thinking I might add a 2″ border, but I’m not 100% sure about that right now. I do like a border to pull everything together and frame it nicely. Seriously…how stinkin’ cute is this fabric??? Gah! I can’t stand it, I love it so much! The ladies at the retreat kept asking who it was for. ME! Duh! Pearl Bracelets for the back of my ‘Bloom Bloom Pow’ WIP quilt, and these super fun astronauts that glow in the dark! I have 6 yards of Pearl Bracelets and 7.25 of the astronauts. 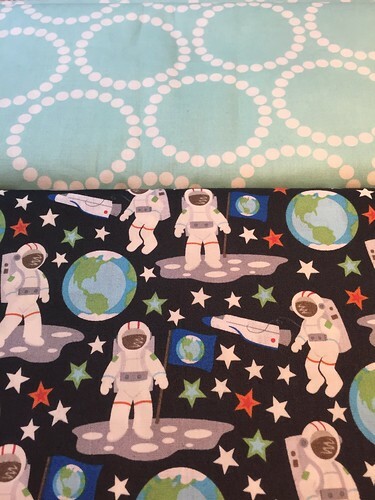 Gretchen insisted that one of us buy the astronauts – she had used them as the back of a super cute baby quilt. I totally stole this pic from her Flickr stream! 🙂 Here’s her front, and she used the glow in the dark astronauts on the back. I have no clue what I’ll do with the astronauts – they may live in my stash for quite a while, but they were a good deal at 50% off and I’m in no hurry to use them. I can’t believe that I finished a top and have another almost complete after the retreat. That’s never happened to me before! I finished two quilts total in 2014, and so far in 2015 I have one completely finished, one that needs a binding, and three tops done (two are awaiting borders). How’s that for improvement from year-to-year? And because I didn’t do it at the retreat at all, I’m hanging out here, cruising the blogs, and drinking my wine. I can’t believe that for the 2nd year in a row I brought home a full bottle of wine! That’s so unlike me! It’s Sunday Stash Day, so I’m linking up to Molli! This entry was posted in Quilts and tagged Molli Sparkles, Out to Sea, pearl bracelets, quilt retreat, Riley Blake Designs, Sarah Jane Studios, Sunday Stash, Twice as Nice. Bookmark the permalink. 50% off and for backing seems like a good reason to drop the no-shopping plan. No kidding! Thanks for stopping by! Thanks! Yes, that astronaut fabric will find a use eventually! So darn cute! Sounds like a great weekend and I’m so envious of the progress you’ve made! 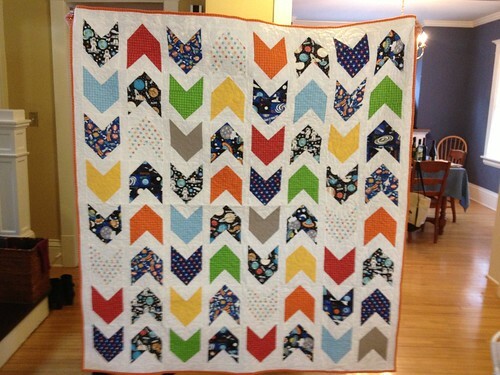 I’ve got Amy Smart’s book ‘Fabulously Fast Quilts’ and keep flicking through wondering just how quick is a fast quilt? Your ‘fast four patch’ looks great – don’t stop now, see it through to the finish! I’m guessing I have about an hour until I have a finished top – just have to press them and sew the rows together. Not far now! You did so well! Retreats are a blast but I typically don’t get as much sewing done as I think I will. I love the astronauts! I tend to REALLY overpack. This time I took more than I needed, but I’m also surprised at how much I got done! Lots of cuffs for lots of pillowcases! It sure is a fun print!